In 2005, the MTA entered into a joint development agreement with developer McCormack Baron Salazar, Inc. to develop Parcel C largely for residential use, with requirements for affordable and senior housing, 62,000 sq ft of community serving retail, a 5-acre open space buffer along the rail line, and 2-3 acres set aside for a future light rail stop. The developer met with the community and presented plans throughout 2007, but the housing downturn in 2008 stopped the project cold. In November 2011, McCormak Baron Salazar received an extension on the agreement that altered the previous development conditions. The Taylor Yard Transit Village, including the ‘RiverPark’ development, consisting of 95 market-rate townhomes starting at $720k, began selling units in 2016. Plans for future include 305 rental apartments (including 108 senior units and 197 affordable family units), 1.5 acres of green space, and 25,000 sq ft of retail development. When Legacy Partners approved plans for phase 2 of LA Media Tech Center began to falter, the community launched a campaign to advocate for Parcel F2 to become the site of a much-needed high school. The LAUSD finally agreed to negotiate for the site, only to have a private developer purchase it out from under them at the last minute. The community was outraged, but in 2006 the LAUSD ultimately acquired Parcel F2 through eminent domain (and the developer walked away with a tidy, unearned profit) to create Central Region High School #13. The school opened in 2010 as the Sonia Sotomayor Learning Academies, consisting of 2 Independent Charter schools and 3 LAUSD Pilot Schools, including the LA River School. Over this decade, California State Parks began to develop a program of public art at the Bowtie Parcel. Several site-specific installations, and numerous pop-up events were created in partnership with local groups such as Clockshop and Project 51. In 2011, Texas developer Trammell Crow entered into a purchase option agreement with the Union Pacific Railroad that included creation of a feasibility study on development options, and the establishment of a value for the site. Trammell Crow also explored the potential for a profitable land swap, while publicly communicating an intention to build a variety of uses including industrial uses or a high-end hotel on the access-constrained site. Members of the Coalition for a State Park at Taylor Yard strongly urged them to drop their option. Based on Trammell Crow’s plan, the Department of Toxic Substances Control developed a Remedial Action Plan (RAP) for the site prioritizing the financial interests of the client (Trammell Crow and the Railroad), rather than the health of the land, water and community. This plan recommends remediating a small portion of the least contaminated area of the site, while capping and developing the remaining 75%, leaving the railroad's legacy contamination in place. 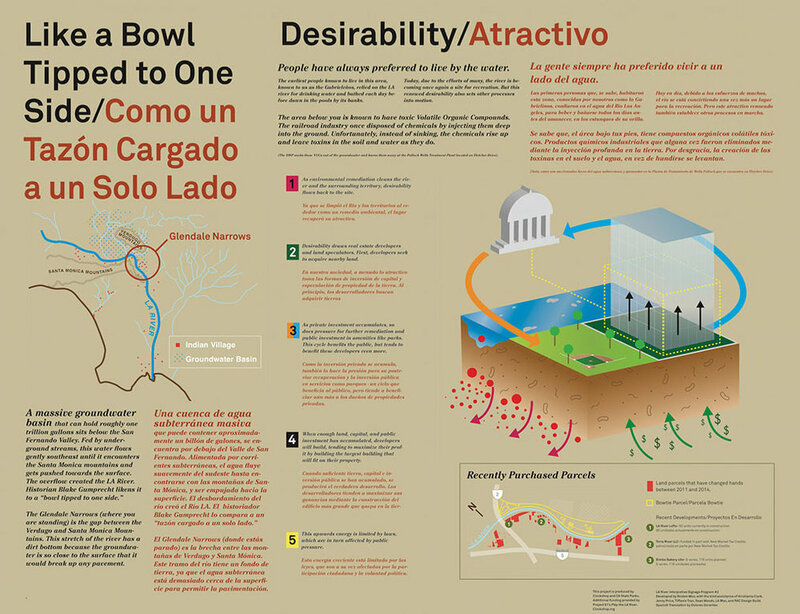 On July 31, 2014, the LA River Project office released a Notice of Intent to Adopt a Mitigated Negative Declaration to move forward with developing a small, engineered treatment wetland on the less contaminated portion of the site, with the possibility future paths, signage, park furniture, and 10 parking spaces. It also mentioned a future phase of unspecified development for the remaining 31 acres. In 2017, the City of Los Angeles purchased the site with MICLA funds and a grant from the Coastal Conservancy. The Santa Monica Mountains Conservancy holds a protective easement on ~10 acres. Currently, the City Bureau of Engineering is managing a public process to create a plan for soil and groundwater contamination cleanup and interim public use. New York-based developer Pan Am Equities is proposing to replace the existing Nelson Miller building with a 419 unit residential and 64k sq ft commercial development at the site, a portion of which is within the 100-year floodplain. The development would also include a 7 story parking structure. Ideally, the site would be added to Rio de Los Angeles State Park. The project’s Initial Study is here. A Draft Environmental Impact Report is anticipated in 2018. A pedestrian and bicycle bridge between Taylor Yard and Elysian Valley has been discussed, promised, budgeted, and planned for over twenty years. The most recent proposal is $19M, 400 ft long x 18’ wide bridge connecting Altman Street/Dorris Place in Elysian Valley to Kerr Road in Cypress Park. The foundations of the bridge are currently specified to sit upon the existing concrete channel walls—an approach that is likely to eliminate the potential for climate-adaptive and public-safety-enhancing alterations to the channel walls. A different configuration for the bridge is necessary for a naturalized Rio de Los Angeles State Park extending from San Fernando Road to the LA River. 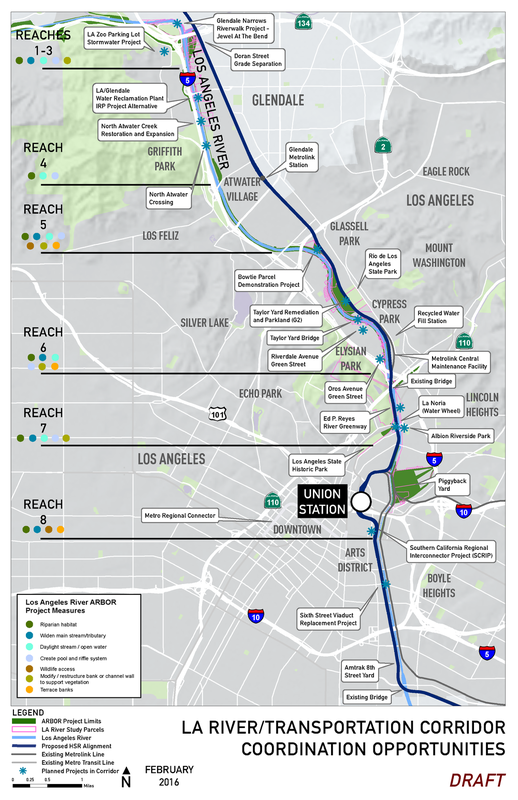 The California High Speed Rail project has been considering various alignments under and through Taylor Yard over the past decade. They are currently planning a surface route alongside the existing Metrolink Rail line that bisects Taylor Yard.